The development of digital technology greatly advances medical research. Under the leadership of Dr. Denis Evseenko, our group performed high-throughput screening (HTS) of 170,000 compounds and identified a small molecule for articular cartilage (AC) remediation in osteoarthritis (OA). HTS is used in the pharmaceutical industry and academia as a primary tool for early-stage drug discovery. Using robotics, liquid handling devices, multi-platform plate readers, high content imaging, and data processing software, HTS allows a researcher to quickly conduct a large number of potential biological modulators against a chosen set of defined targets. Human adult AC has little capacity for intrinsic repair and regeneration once it is injured. No disease-modifying drug is clinically available. Current treatment is pain management and surgery. Therefore, seeking a new tool to promote AC regeneration and prevent AC degeneration is critical in OA treatment. Based on the correlation between IL-6 family cytokines, AC hypertrophy, and catabolism,,, we hypothesized that a small molecule regulating this pathway could prevent cartilage loss. HTS was designed using limb cells from Col10a1 (AC hypertrophy marker)-mCherry mice and culturing them in the presence of bone morphogenetic protein-4, a driver of developmental chondrocyte hypertrophy; 170,000 compounds were assayed for their ability to decrease the mCherry signal. 75 were chosen for secondary screening. The regulator of cartilage growth and differentiation (RCGD) 423 was finally selected for further characterization. 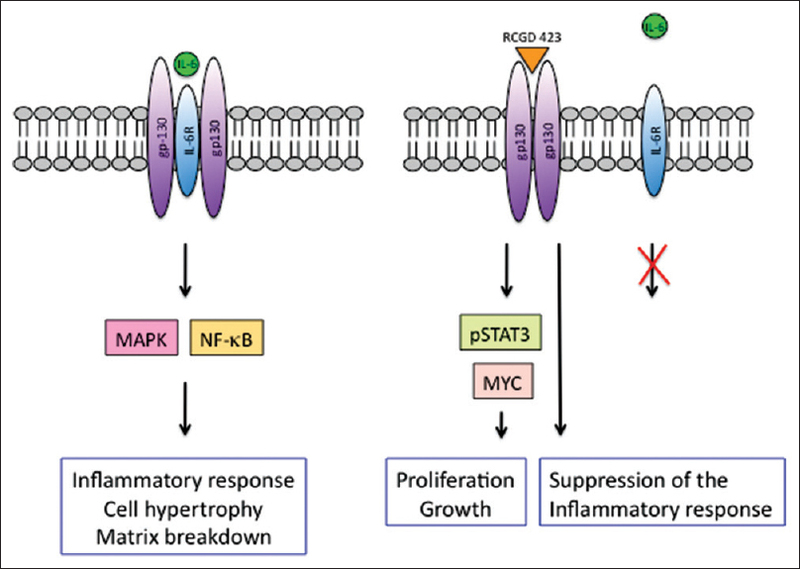 Following an extensive search, we identified that RCGD 423 could prevent AC degeneration, attenuate hypertrophy, and promote repair by directly modulating gp130 signaling. In the disease scenario, RCGD 423 could attenuate hypertrophy in vitro in articular chondrocytes from patients with OA. By intra-articular administration, this compound greatly reduced chondrocyte hypertrophy, loss, degeneration, and osteophytes formation while increasing chondrocyte proliferation in a rat model of OA (partial meniscectomy). Moreover, RCGD 423 improved cartilage regeneration in a rat full-thickness osteochondral defect model, increasing proliferation of mesenchymal cells in the defect and also inhibiting the breakdown of cartilage matrix in de novo generated cartilage. These results identify a novel strategy for AC remediation via small molecule-mediated modulation of gp130 signaling. Other sophisticated digital tools were also involved in this study. Swissdock and Gold Programme were used to analyse the interaction of RCGD 423 with gp130. This revealed a potential high-affinity binding site in domain 2 of the gp130 extracellular region. RCGD 423 increased the proliferative potential and decreased apoptosis in articular chondrocytes. To evaluate the effects of RCGD 423 on human adult articular chondrocytes at the molecular level, RNA sequencing (RNA-Seq) was carried out. Genes that were significantly enriched in drug-treated samples were further analyzed using Gene Ontology (GO), and revealed categories related to cell cycle, secretion, and migration. We compared the enriched genes in the GO M phase after RCGD 423 treatment with MYC targets defined by chromatin immunoprecipitation Seq (ChIP-Seq)., The results further reveal that regulation of gp130-STAT3-MYC signaling pathway is involved in the mechanisms of RCGD 423 function. With the inputs of digital biotechnologies, we have identified a novel small molecule that reveals prominent disease modifying activity in two rat models (OA and cartilage injury). Optimized analogs of this compound may represent attractive therapeutic candidates for patients with both degenerative and inflammatory forms of arthritis. Shkhyan R, Van Handel B, Bogdanov J, Lee S, Yu Y, Scheinberg M, et al. Drug-induced modulation of gp130 signalling prevents articular cartilage degeneration and promotes repair. Ann Rheum Dis 2018;77:760-9. Broach JR, Thorner J. High-throughput screening for drug discovery. Nature 1996;384:14-6. Sokolove J, Lepus CM. Role of inflammation in the pathogenesis of osteoarthritis: Latest findings and interpretations. Ther Adv Musculoskelet Dis 2013;5:77-94. Lotz M, Moats T, Villiger PM. Leukemia inhibitory factor is expressed in cartilage and synovium and can contribute to the pathogenesis of arthritis. J Clin Invest 1992;90:888-96. Henrotin YE, De Groote DD, Labasse AH, Gaspar SE, Zheng SX, Geenen VG, et al. Effects of exogenous IL-1 beta, TNF alpha, IL-6, IL-8 and LIF on cytokine production by human articular chondrocytes. Osteoarthritis Cartilage 1996;4:163-73. Hui W, Bell M, Carroll G. Soluble glycoprotein 130 (gp130) attenuates OSM- and LIF-induced cartilage proteoglycan catabolism. Cytokine 2000;12:151-5. Collison J. Osteoarthritis: Targeting gp130 aids cartilage repair. Nat Rev Rheumatol 2018;14:182. Zeller KI, Jegga AG, Aronow BJ, O'Donnell KA, Dang CV. An integrated database of genes responsive to the Myc oncogenic transcription factor: Identification of direct genomic targets. Genome Biol 2003;4:R69.